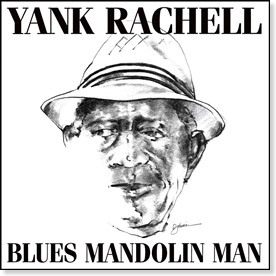 Blind Pig Records has reissued a series of tracks recorded by legendary blues mandolinist Yank Rachell in 1986 on a new collection entitled Blues Mandolin Man, a title to match a book about Rachell published in 2001 by the University Press of Mississippi. On the recording, Yank is joined by a full rhythm section that finds him in fine form, his voice and instrumental skills still strong and compelling near the end of a career that began in the late 1920s. Yank is joined on the recording by guitarist Peter Roller, drummer Leonard Marsh Jr., Sheena Rachell on electric bass and blues harmonica great Peter "Madcat" Ruth. Kew-well! The tribute album recorded by the likes of Grisman & O'Brien was the appetizer. Now for the main course. Thanks for the update! I bought it and I like it! Ordered right after I checked the Cafe home page today, from Elderly. Already have a few Yank gems, but really looking forward to this one! I've been listening to this almost nonstop since I got it. Can't get enough. Can anybody tell me what Yank's playing to produce the sound on this album? Is it just an electric resonator mandolin? I would assume Yank played his Harmony batwing electric on these sessions. About 25 years ago. I saw Yank Rachell at a folk festival, where he was taking part in a "mandolin-style summit" of sorts. There was Jethro Burns, and a few bluegrass players, all being backed up by a guitarist and a young bass player, whom I didn't know. After the tune was finished, Yank mumbled something about being "unprepared" and the young fellow answered, "Music has four beats to the bar..."
I've been reading Yank's 'autobiography' (with Richard Congress) "Blues Mandolin Man." A very delightful, funny and informative tale so far. Reads like a series of transcribed tapes of Rachell riffing on varies topics, musical and otherwise, and people in his life. There's more on other folks' commentary on YR's playing style etc. which is coming up next.